Last Friday our entire team had the distinct privilege of sharing lunch together with Tony DiGiovanni, Executive Director of the largest landscape association in North America. We sat in one of the spacious training rooms at Landscape Ontario’s Milton Campus listening to Tony tell us the stories of the association he leads, the industry he serves and the many, many people he has come to know and care about. We could’ve sat there all day. Landscape Ontario was formed over 40 years ago, in 1973. To this day, the organization is still operated by industry people for industry people, with over 2400 members and 350 member volunteers. It is one of the largest associations of its kind in the world from the perspective of membership, programming and an engaged volunteer force. Tony began his tenure as Executive Director of the Association at the same time as I took my place in a Grade 3 classroom. It became obvious to us that over the course of 25 years on the job that Tony has come to know this industry well. His passion to see the membership succeed is unequivocally his top priority. We were pleasantly surprised to hear Tony say that if there’s something that is beneficial to the membership he and his team will support it, even if it’s not necessarily beneficial to the association itself (or to his own position for that matter). The Prosperity Partners program is based on an idea that is often expressed in our office: helping business owners in this industry to start identifying themselves not as “landscapers” but as business owners of companies that do landscaping. This is perfectly aligned with our own mission: “to help skilled tradespeople promote their companies truthfully and artfully for sustainable growth.” In fact, we see the emergence of more powerful, meaningful, recognizable brands in the home improvement industry. We have been fortunate to work with many great brands in the landscaping industry already but it was especially encouraging to learn how closely aligned we are with the professional organization that represents them. After a light lunch and some great conversation, Tony led us on a nose-to-tail tour of the facilities. We met many of the faces that work tirelessly on behalf of the green industry and were impressed by their hospitality and professionalism. We walked by – and through – many ongoing classes as Tony told us of the huge number of benefits and professional development opportunities they provide for members. We were amazed at what a valuable resource they are for industry people and wondered if everyone knows about the full scope of their work! 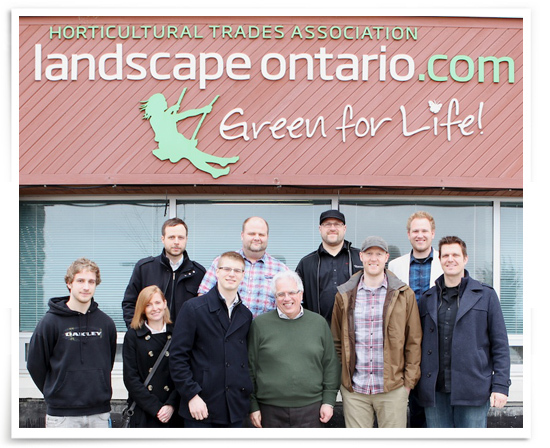 We’d like to thank everyone at the Landscape Ontario site for their kind welcome and for taking the time to meet with us and offer insight into the Association. Especially, we’d like to thank Tony DiGiovanni for his time, his insights and his stories; they were both informative and enjoyable. We wish you well in your mission, the effects of which really end up helping us all to better enjoy our outdoors! For more information on Landscape Ontario check them out online at landscapeontario.com or horttrades.com.